Before Jayant Kripalani coughed his way into millions of Indian households in the iconic ad that cemented Vicks as the reliable remedy for “khich-khich”, the company that made it faced a circuitous journey to overcome bureaucratic hurdles and alter its perception as an allopathic medicine from the West. Contending with hostile regulations, Vicks emerged as a classic example of how over-regulation may produce unintended consequences, some of which undermine the very purpose of governmental control. The unvarying blue jar of Vicks VapoRub, a ubiquitous restorative for the common cold in homes across the world, evokes nostalgia and familiarity for many Indians. As a brand that has steadily gained the Indian market from the 1960s, it is difficult to dissociate the story of Vicks from that of the growing Indian middle class. But Vicks reached the Indian masses nearly seven decades after its inception in the US, and by then it had developed both its unique identity and a global presence, and even an interesting bedtime storybook for children. Vicks was introduced in India in 1964, through a public limited company called Richardson Hindustan Limited (RHL). The parent company, Richardson Merrell, had established an office in India in 1951, but it was only with the institution of a public limited company with more than 10,000 Indian shareholders in 1964 that the brand gained operational freedom. In the 1960s, RHL was one of many subsidiary companies selling Vicks across the world. It was a remarkable feat for a drug conceived out of necessity at a downtown drugstore in Greensboro, North Carolina. Richardson had patented more than 21 drugs by 1894, but it was the salve, influenced by Eastern medicine, which broke the market. The ingredients presented a mix of familiarity and mystery. Vintage advertisements declared the salve to be a combination of reliable “old-fashioned” ingredients such as camphor, turpentine and menthol with a curious secret additive, which the company still refers to as “a little-known Japanese ingredient”. When the salve is rubbed on the chest, body heat vaporizes the menthol, which results in the release of soothing vapours. It is suggested that Richardson christened the salve as the Vicks Magic Croup Salve in honour of his brother-in-law, Joshua Vick, a physician under whom he had trained as a pharmacist in Selma before setting up his independent practice. But legend has it that Richardson was compelled to dedicate the salve to his brother-in-law by a cruel twist of fate: his name was simply too long and cumbersome to fit on the tiny salve jars. Whether this pickled Richardson is unknown, but vintage ads until 1906 loudly declare Richardson’s name as the manufacturing chemist beneath the Vicks salves and ointments. Selected happily or not, the name turned out to be propitious when Richardson’s son renamed the croup salve as Vicks VapoRub in 1911. With a distinct appeal as a modern rub, in place of the traditional ointments and liniments that crowded the market, Vicks carved out a niche for itself as easy to apply and stainless, with a relaxing odour. 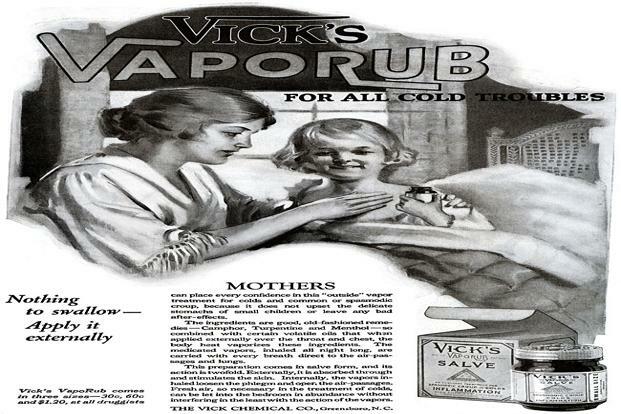 Vicks VapoRub went on to solidify its position as the prime remedy for sick children. Vintage adverts of the period directly address mothers, and offer Vicks as the easiest solution to common illnesses. A storybook released by the company in 1925 narrated the adventures of two elves, Blix and Blee, who reside in an empty Vicks VapoRub jar and must rescue a sick child from the clutches of common cold. By 1930s, Vicks had grown to recognize adults as an equally crucial segment of users, and its adverts reflected a shift in focus towards the embarrassment of coughing and sneezing in public spaces, and the aid of a clear voice in romantic pursuits. Vicks Romantic Bachelor, a radio show featuring love stories interwoven with advertisements for various Vicks products, ran through 1933. The common cold, unsurprisingly, was as frequent among adults as children, and luckily for Vicks, this meant a hitherto unexplored market. As a country of hot monsoons and dry winters, India was primed for the product. Gurcharan Das, who joined the Richardson Hindustan Bombay office in 1966, recounts how the organization was keen to develop the brand organically, through extensive visits to bazaars and long interactions with customers. This approach was credited to Surin Banta, the managing director of Vicks in India, by both Das and Bharat Patel, who went on to become the chairman and managing director of Proctor and Gamble (P&G) India. Banta’s grassroots approach yielded indigenous insights that would refine the brand’s appeal to Indian households. In his book India Unbound, Das recounts how an encounter with a housewife during field visits in Surat introduced him to the practice of adding a spoonful of Vicks VapoRub to a vat of boiling water to infuse the steam with the drug. Das incorporated this method in the advertisements, which magnified the salve’s popularity. The elasticity of the product, its amenability in usage and the ingeniousness of Indian customers to adapt products to local contexts allowed Das and his team to constantly innovate. Das coined the phrase “wet monsoon colds” in ads playing during the months of July and September, to capitalize on the ubiquity of common colds during monsoons. Patel spearheaded the campaign for a tablet-based solution as well, resulting in Vicks Action 500. But Vicks was operating in a climate of strict regulation, with restrictions on expanding operations and price controls that hindered profit margins. In 1964, the drug industry was regulated by the Drug Price Control Order (DPCO), which came under Section 3 of The Essential Commodities Act, 1955. The Act empowered the government to regulate and prohibit the “production, supply, distribution, trade and commerce” of any commodity deemed as “essential” and thus worthy of ensuring equitable distribution. Drug prices were not regulated in India until 1962, but in the wake of Chinese aggression, the government feared an escalation in prices due to the scarcity of drugs. This led to the first instance of the control of drug prices in 1962 under the Defence of India Act, 1915. The war eventually ended, but the DPCO remained. In its various iterations (including the 2013 version), it defined drugs as “any pharmaceutical, chemical, biological or plant product including its salts, esters, isomers, analogues and derivatives, conforming to standards specified in the Drugs and Cosmetics Act, 1940”. In 1966, the DPCO made prior approval of prices by the government mandatory for the manufacture of drugs. For Vicks, which fell under the DPCO and was expanding rapidly, this was a time of reckoning. C. Rajagopalan notes in International Marketing that by the 1980s, the sales of Vicks had reached a peak of 80 million units, but price and profit ceilings called for severe cost-cutting measures. In an effort to reduce production costs in India, the petroleum base of the product was replaced with locally sourced oils. In 1983, a nationwide boycott by chemists placed the company under immense strain. The boycott was triggered, Das notes, by a “fight for higher margins by the entire industry”. Retailers and chemists, who sell drugs manufactured by pharmacists, dictate the availability of drugs in the market, and consequently, their price. Pradeep Mehta in Business Standard notes that for nearly 20,000 drug manufacturers, there are nearly 800,000 retailers. Nationwide boycotts by chemists targeting individual companies were frequent in the early 1980s. Nestle products were boycotted by the Retail and Dispensing Chemists Association of Bombay in 1984. The boycott in 1982 by the All India Organization of Chemists and Druggists of pharma companies looking to expand stockists through state cooperative organizations had adverse implications on the drug market. Between the DPCO and the boycott, Vicks was hard-pressed for solutions. It was Patel who came up with the revolutionary idea of rebranding Vicks as an Ayurvedic product. Both Patel and Das describe this as the watershed moment for the history of the brand. The DPCO applied to “pharmaceutical, chemical, biological or plant products”, leaving little scope for exception. However, in an effort to encourage indigenous and small and medium-scale industries and to further import substitution, it excluded three notable types of drugs. These were “any medicines included in any bonafide Ayurvedic (including siddha) and unani (tibb) system of medicines; any medicine in the homeopathic system of medicines; any substance to which the provisions of the Drugs and Cosmetics Act, 1940 (23 of 1940) do not apply”. Das writes in India Unbound that Patel’s suggestion was met initially with incredulity by the team. But as they played along to the possibility of his suggestion, it seemed, much like Vicks itself, the easiest remedy. T. Rajagopalan, manager of research and development at the time, corroborated the ingredients of Vicks with ancient texts at the Ayurvedic library at Bombay University, and legally, Vicks was registered as a brand under the Indian system of medicine. Richardson’s reliance on herbs and Eastern medicine ensured the ingredients held up to scrutiny. The benefits of being a registered Ayurvedic product were enormous. As an Ayurvedic company, it was exempt from licences, excise duty and price control. Vicks could now freely be circulated in non-drug stores, and as Das notes, outlets carrying Vicks tripled to 750,000. The company went on to establish a full-fledged Natural Products Research Centre at Kalwe, Maharashtra, in 1985. Under the supervision of Rajagopalan, more Ayurvedic products were introduced in the market and Vicks pitched an entry into Soviet markets as a “natural, herbal, Ayurvedic product”. By the time P&G took over RHL in 1985, India was established as the leading producer of Vicks VapoRub among more than 130 countries. The DPCO continues to make the exception for Ayurvedic, Unani and homeopathic drugs. As Das writes, “over-regulation has bizarre consequences”. In the case of Vicks, it resulted in the integration of a Western brand into the very fabric of Indian life. This essay is part of a project based on videos, written stories, newspaper archives, and visual sources such as cartoons and advertisements collected by IndiaBefore91 , a crowdsourced initiative to document and discuss life in a pre-liberalized economy.